The first General Officer casualty in 1917 occurred on 24th January when Brigadier-General Cyril (not Cecil, as many sources erroneously state) Prescott-Decie, C.R.A. 4th Division (left), was severely wounded ‘somewhere in France’, although he would recover, becoming B.G.R.A. * Irish Command at the end of the war, before retiring in 1920. The first general to die, on the right, was Brigadier-General Walter Long D.S.O., G.O.C. 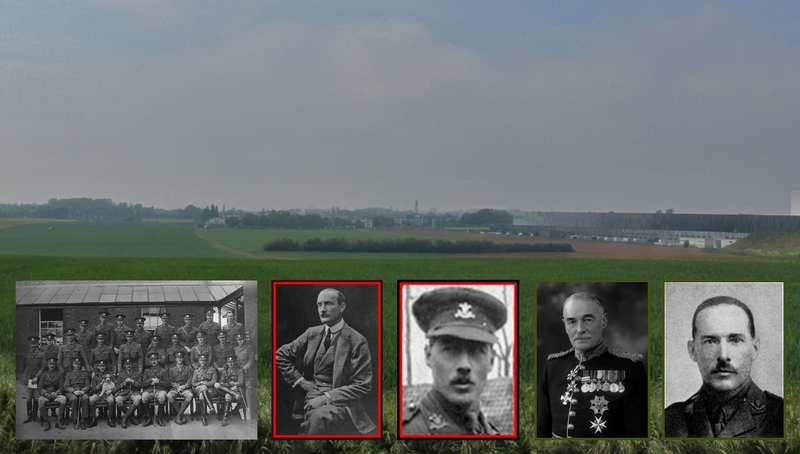 56th Brigade, 19th Division, killed by a shell on 28th January while inspecting the trenches in front of the village of Hébuterne on the Somme, the church tower of which you can see on the horizon of the background shot. Long was 37 and the only officer casualty the division suffered during this particular tour of the trenches. 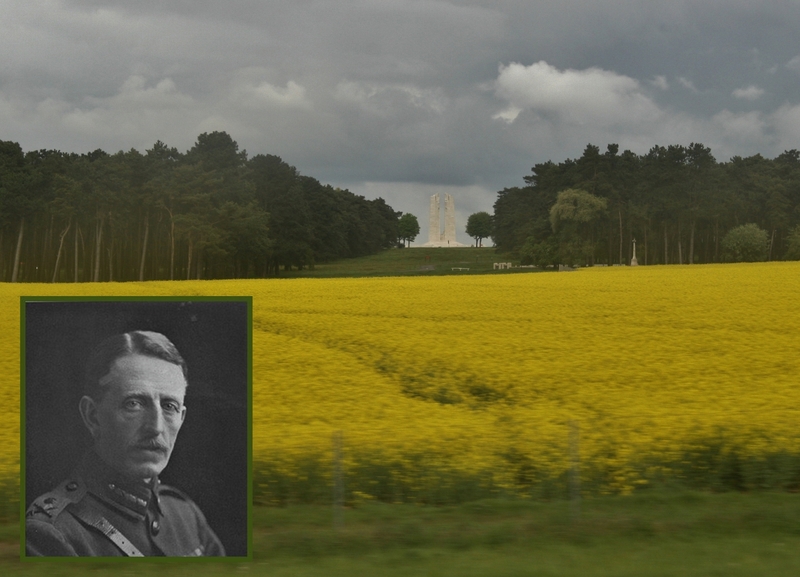 He is buried in Couin British Cemetery, a few miles away to the west. On 11th April, Brigadier-General Charles Bulkeley Bulkeley-Johnson, G.O.C. 8th Cavalry Brigade, 3rd Cavalry Division, pictured seated, fourth from right, in the group shot far left, and in mufti second left, was killed while personally reconnoitering the German positions near Monchy-le-Preux. 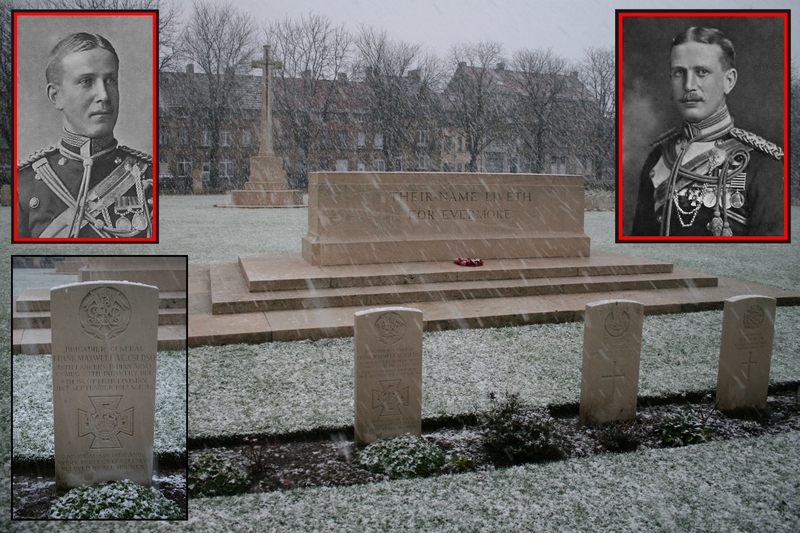 Two days into the Battle of Arras, with snow still falling, and despite warnings that to go any further would necessitate a series of diagonal sprints from shell hole to shell hole, Bulkeley-Johnson persisted in continuing straight on, the inevitable German sniper bullet hitting him in the face; dragged to a shell hole he died soon after. His body was recovered that night and he is buried in Gouy-en Artois Communal Cemetery Extension. He was 49. That same day, 11th April, Brigadier-General Percy Vere Powys Stone D.S.O., G.O.C. 17th Brigade, 24th Division, was wounded by a shell at Arras, although he remained at duty, commanding his brigade. It was his third wound of the war, and he is an excellent example of an unknown general who I think must have been the bravest of men, albeit no one remembers him any longer, nor is there much information to be found about him, nor do there appear to be any photographs of him, at least not that I could find. An unknown general indeed, and yet the bare bones, because that is all there is, seem to suggest that Stone served his country well; a teenage veteran of the final months of the South African War, he continued to serve in Africa with the West African Frontier Force before returning to England, would be wounded at Hill 60 in 1914, and then again at Arras in March 1916, before his third wound in 1917. He would continue to command his brigade until June 1918, and was only 37 when he retired in 1920, dying in 1959 at the age of 76. He had held a command in the toughest of theatres for three years, gained a D.S.O. along the way, and, incidentally, was mentioned seven times in despatches. The unknown General Percy Stone. One of many. The centre inset shows Brigadier-General Charles Gosling, G.O.C. 10th Brigade, 4th Division, already wounded twice (once severely), and killed by a shell near Arras on 12th April. 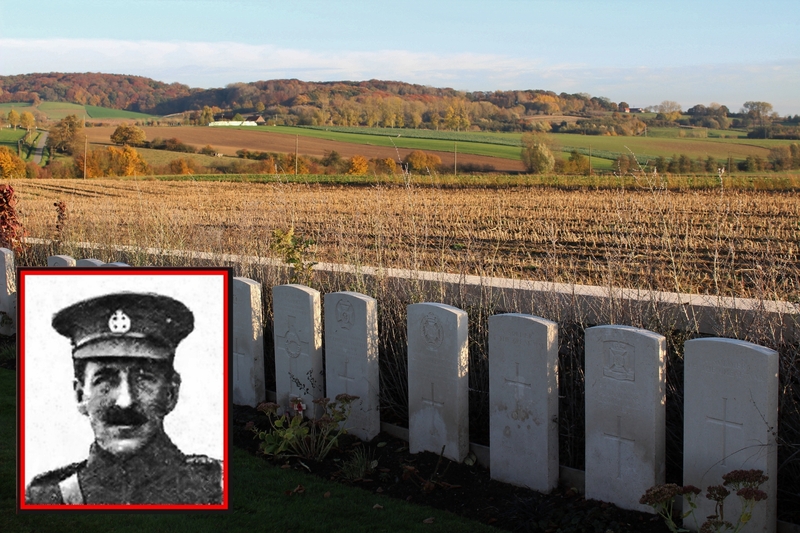 Aged 48, he is buried in Hervin Farm British Cemetery, St. Laurent-Blagny. The same day, Brigadier-General Godfrey Estcourt Matthews, G.O.C. 198th Brigade, 66th Division, wounded on Gallipoli in June 1915*, was hit by a shell and died the following day at Bethune Casualty Clearing Station, aged 50 (no image). He is buried in Bethune Town Cemetery. 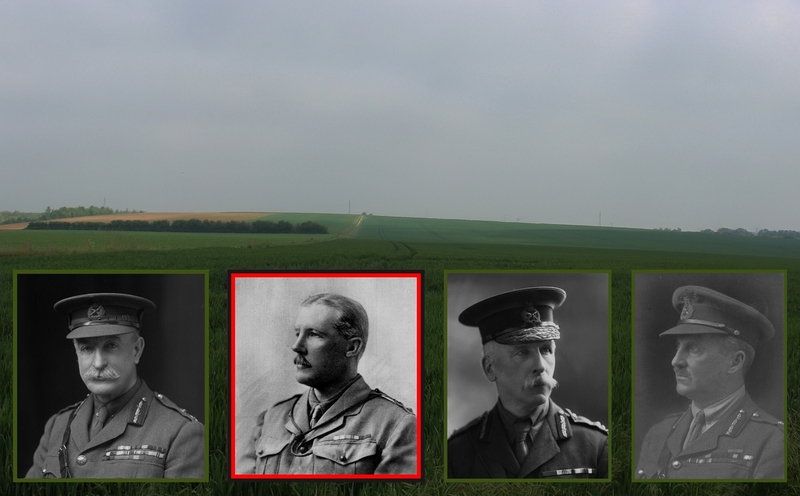 13th April saw Major-General Percival Spearman Wilkinson, G.O.C. 50th Division (centre right), wounded during the Ashanti Campaign in 1900, wounded once more by a piece of shell near Arras, although he remained on duty, and on 24th April Brigadier-General Douglas Edward Cayley, G.O.C. 88th Brigade, 29th Division (far right), was slightly gassed, also near Arras. *Matthews is the first of five generals we shall meet in the final two posts of this series who were wounded on Gallipoli but were not included in the Gallipoli post as I can find no evidence that they were generals at that time. Major-General Colin John Mackenzie, G.O.C. 61st Division (far left), shot in the face by a German sniper on 27th April 1917 near Molinghem. His wound (he was shot through the cheek and parotid gland) did not respond to treatment and he was evacuated to England, retiring in 1920. On 30th April Brigadier-General Hardress Gilbert Holmes, G.O.C. 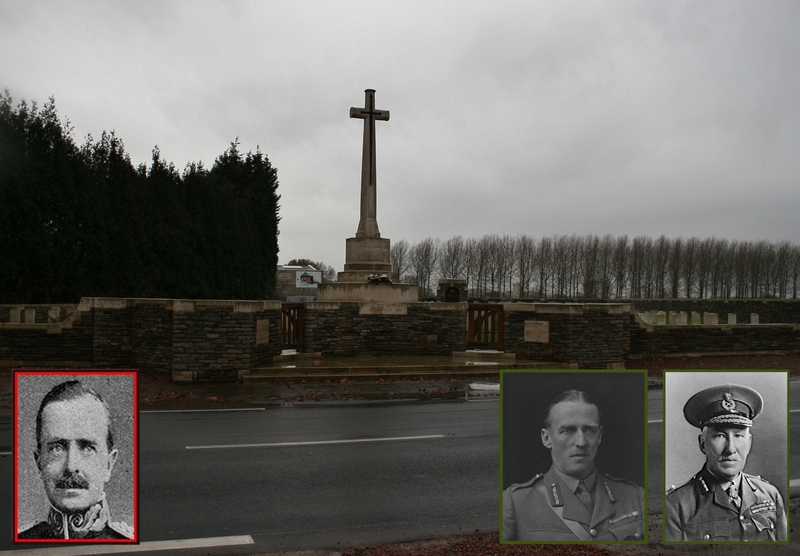 8th Brigade, 3rd Division (no image), was slightly wounded in the eye when a German shell hit his headquarters near Monchy, and on 2nd May, Brigadier-General Vincent Alexander Ormsby, G.O.C. 127th Brigade, 42nd Division (centre left), aged 51, was hit by a German shell whilst reconnoitering the front lines at Ronnsoy, south east of Epehy. Struck by a number of pieces of shrapnel, his jugular vein severed, Ormsby died soon after, and was buried in Villers-Faucon Communal Cemetery and Extension. Also on 2nd May, Major-General Edward Ranulph Kenyon, C.E. 3rd Army (centre right), was wounded by a shell splinter in the arm at Arras, although he would return to command, and on 9th May Major-General Archibald Buchanan Ritchie, G.O.C. 11th Division (far right), was severely wounded by shell fire near Beaulencourt on the Somme, although he too would return to France a year later. On 30th May Brigadier-General George Northcote Colvile, G.O.C. 68th Brigade, 23rd Division (no photo), was severely bruised by a piece of shell at Railway Dugouts near Ypres. Colvile is an example of a general included in the Bloody Red Tabs book previously mentioned who shouldn’t really be there. He was actually a colonel when injured, receiving the honorary rank of Brigadier-General somewhat later, on 28th October 1917. There surely must have been other acting brigadier-generals who were wounded during the war, and it may be that one or two who are included in this series might, on further research, also prove to have been acting at the time of their injury, but I personally have no intention of delving further. 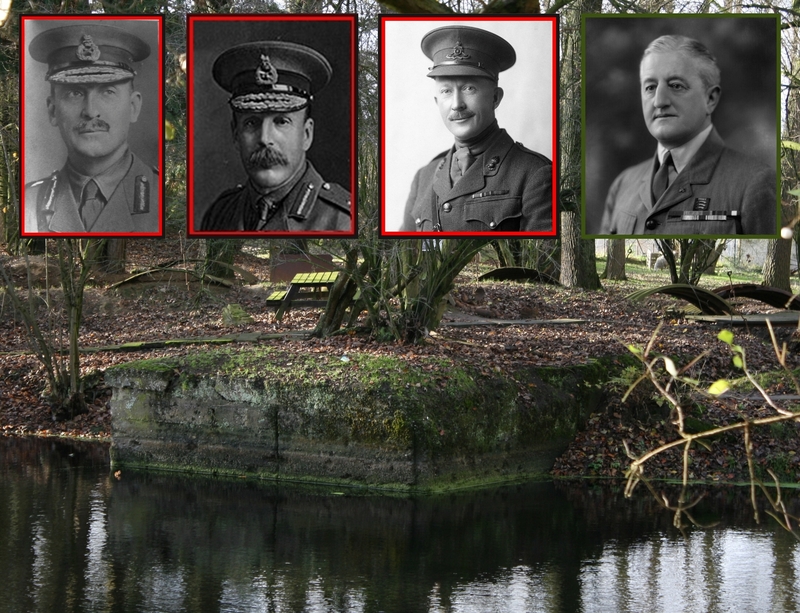 Pictured on the far left is Brigadier-General John Randle Minshull Minshull-Ford D.S.O. M.C., G.O.C. 115th Brigade, 38th Division, wounded in the arm at the Battle of Neuve Chapelle in June 1915, and twice more during the war, the final time at Elverdinghe by shellfire on 3rd June 1917, although he would return to command. In the centre, Brigadier-General Walter Ramsay McNicholl D.S.O., G.O.C. 10th Australian Brigade, 3rd Australian Division, wounded in the leg at Krithia on Gallipoli in 1915, and badly gassed on the night of 6th June 1917 somewhere in the Messines area. He would hold various commands once he returned from his injuries. And on the right, Brigadier-General Charles Henry Jeffries Brown D.S.O., G.O.C. 1st New Zealand Brigade, New Zealand Division, killed by a shell on the second day of the Battle of Messines, 8th June. He was 45, his funeral in Bailleul Communal Cemetery Extension (bottom right) attended by both his sons. Lieutenant-General Walter Norris Congreve V.C., G.O.C. XIII Corps, wounded at Colenso in 1899 during the action that saw him awarded the Victoria Cross, and seriously wounded once more at the foot of the Vimy Ridge (background) on 12th June, his left hand blown off. That minor inconvenience wasn’t going to stop him, so he returned with a hook instead of a hand. Lieutenant-General Robert George Broadwood, G.O.C. 57th Division (left), was hit by a German shell while crossing a bridge over the River Lys at Houplines, his legs blown to pieces, dying of his wounds later that day, 21st June. He had previously been reported for ‘lack of fighting spirit’ for not wishing to send his men on hopeless missions, and his death had an element of suicide in it – much in the way we today have ‘suicide by cop’ – Broadwood reportedly saying, knowing that he was dying, that after his reproach he was glad to go, and wished to be buried between a soldier and a subaltern, which he was, at Anzac Cemetery in Sailly-sur-la-Lys. He was 55. 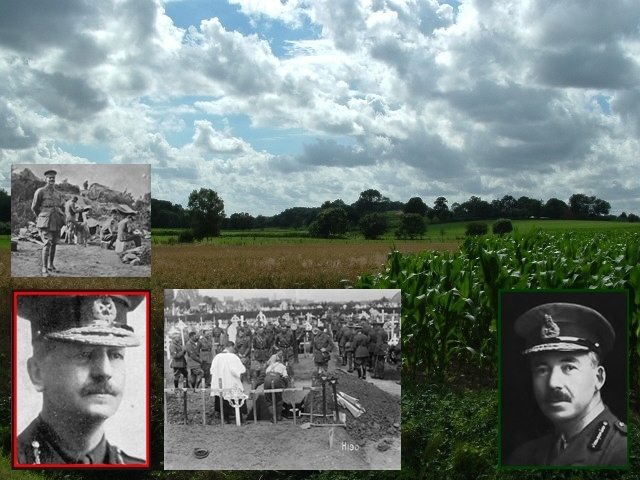 The two photographs on the right are (left) Brigadier-General Arthur Benison Hubback, G.O.C. 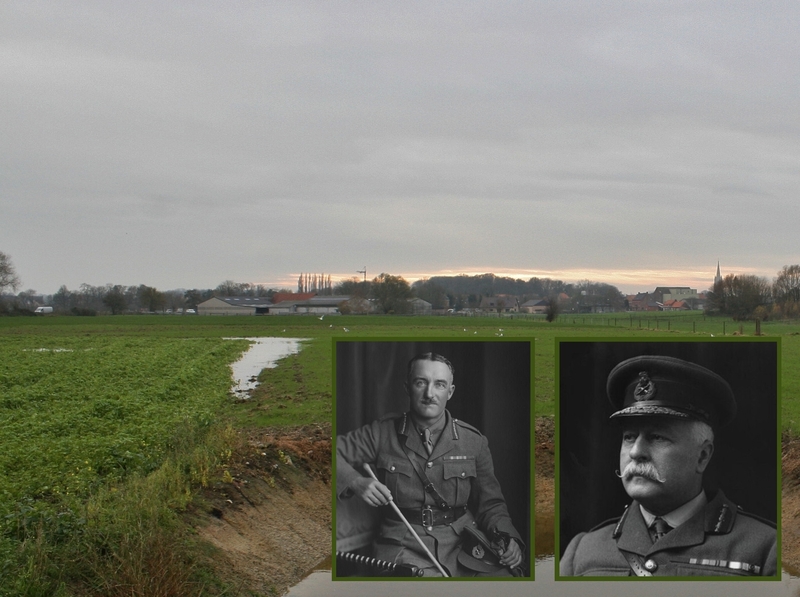 2nd Brigade, 1st Division, slightly wounded visiting the lines on 1st July near Coxy de Bains, and (right) Brigadier-General Charles Henry Brand D.S.O., G.O.C. 4th Australian Brigade, 4th Australian Division, wounded by shellfire on 6th July. Both returned to command. Brigadier-General Edward Arthur Fagan D.S.O., G.O.C. 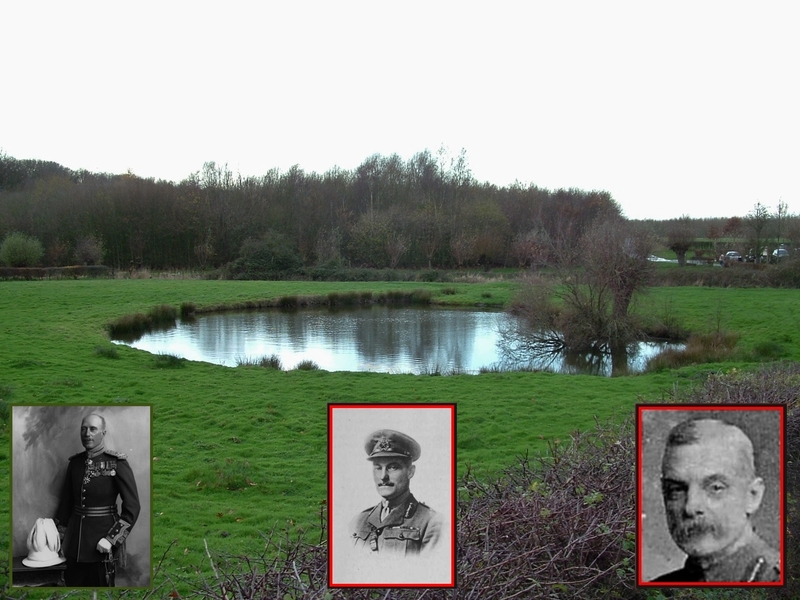 46th Brigade, 15th Division (left), gassed on 18th July near Ypres, although he would return. In the centre, Brigadier-General Charles William Eric Gordon, G.O.C. 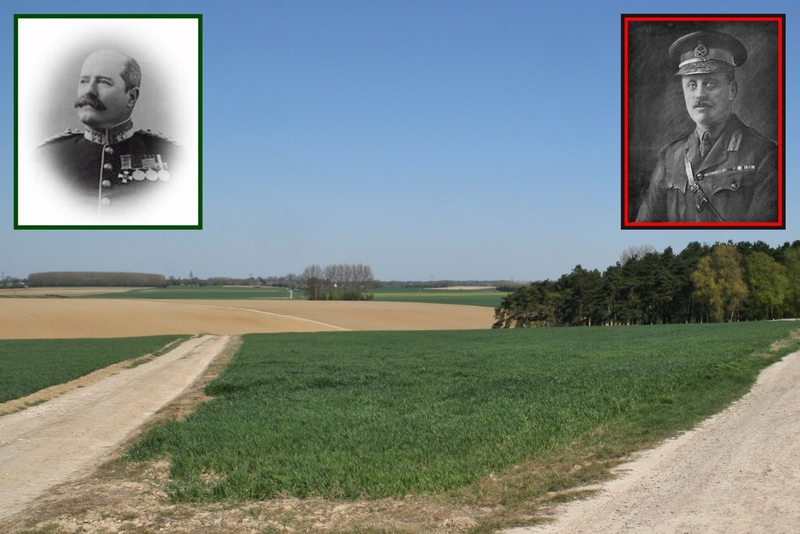 123rd Brigade, 41st Division, killed by a direct hit from a shell on the track between Spoilbank and Voormezeele on 23rd July (the background photo is taken at Spoilbank). He was 39 and is buried in Reninghelst New Military Cemetery. On the right, Brigadier-General John Arthur Tanner D.S.O., C.E. * VII Corps, killed by a shell behind Wancourt on his way to inspect defenses on 23rd July. He was 59 and is buried in Bucquoy Road Cemetery, Ficheux. Brigadier-General Alister Fraser Gordon D.S.O., G.O.C. 153rd Brigade, 51st Division (left), wounded in the leg at the Battle of Festubert in May 1915, and more seriously wounded by a shell while inspecting trenches on 29th July prior to the forthcoming Third Battle of Ypres. He died of wounds two days later on 31st July as the battle began, aged 45, and is buried in Lijssenhoek Military Cemetery. On the right, Major-General Torquhil George Matheson, G.O.C. 20th Division, gassed on 7th August just as his division was about to go into action. He would return the following month to command 4th Division. Brigadier-General Francis Earl Johnston, G.O.C. 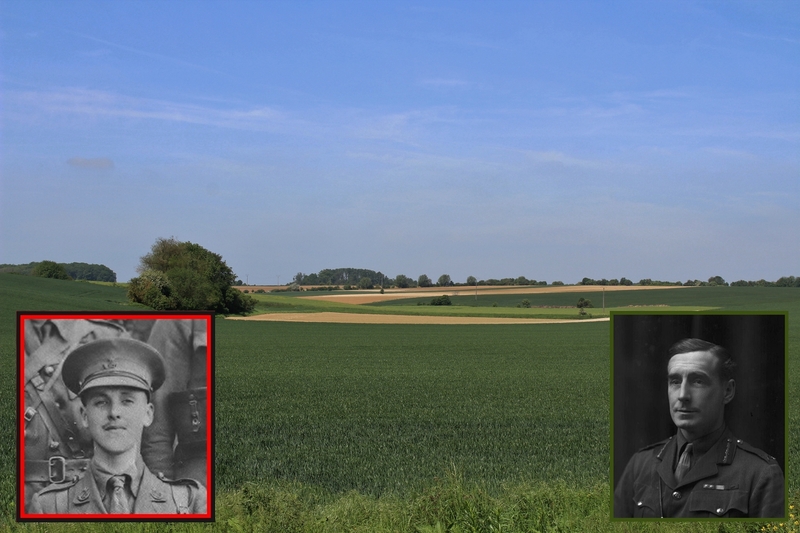 3rd New Zealand Brigade, New Zealand Division, killed by a sniper in the mud-filled shell holes that served as trenches at La Basseville, east of Ploegsteert Wood (background photo), on 7th August. He was 45 and is buried in Bailleul Communal Cemetery and Extension. The top left inset shows Johnston and his staff on Gallipoli before the Krithia attack in May 1915, and the centre inset shows his funeral. His replacement, Brigadier-General Robert Young D.S.O. (right), fared little better. Just one day after taking over the brigade following the death of Johnston, Young was himself seriously wounded on 9th August by a bullet when visiting the front lines at Ploegsteert Wood. Brigadier-General Ronald Campbell Maclachlan D.S.O., G.O.C. 112th Brigade, 37th Division, severely wounded at Ypres in December 1915, and killed by a sniper while in the trenches near Oostaverne on 11th August 1917. He was 45 and is buried in Locre Hospice Cemetery; his headstone is the fourth from the right, the Kemmelberg in the background. On 15th August Brigadier-General Phillip Leveson Gower D.S.O., G.O.C. 49th Brigade, 16th Division (no image), was gassed near Potijze, his second wound of the war, although he soon returned to reassume command. Brigadier-General Malcolm Peake C.M.G., C.R.A. I Corps, killed by a German shell while reconnoitering on Hill 70 at Loos on 27th August aged 52, and buried in Noeux-les-Mines Communal Cemetery and Extension. 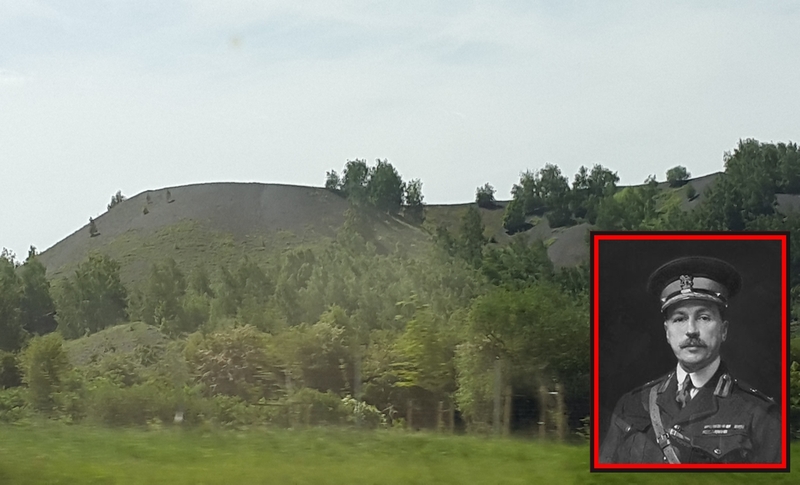 The background photograph shows the slag heap at Noeux-les-Mines today. Elsewhere, although I have photographs of none of them, Brigadier-General Davison Bruce Stewart, C.R.A. 66th Division, was wounded in the forearm by shrapnel at St. Idesbalde on the Belgian Coast on 28th August, Brigadier-General William Bain Richardson Sandys, B.G.R.A. XIX Corps, was wounded on 8th September, and although it appears the records of the nature of his wound have been lost, he would return to the Corps before the end of the war, and Brigadier-General Alexander Colin Johnston D.S.O. & Bar, M.C., G.O.C. 126th Brigade, 42nd Division, was shot by a sniper on 16th September, at Railway Wood, just two days after taking over the brigade. He was wounded four times during the war. Major-General George Tom Molesworth Bridges D.S.O., G.O.C. 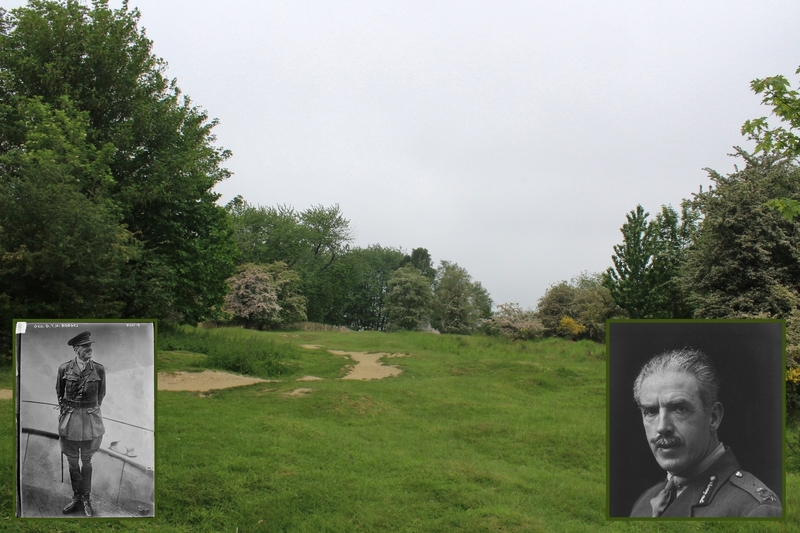 19th Division (both photos – I love the photo on the left), wounded by German artillery fire, his right leg shattered, as he left a dugout on Hill 6o (main photo) on 20th September 1917 during Third Ypres. Bridges had suffered serious wounds in two previous wars; in South Africa he was wounded by a rifle bullet in the shoulder, and in Somaliland in the years immediately following he was again shot by a bullet that went through his shoulder, just missing his spine. In the early days of the war he was the major who, despite a shattered cheekbone and concussion, rallied the troops at St. Quentin with a drum and tin whistle grabbed from a local shop, and placed the town’s acting commanding officers, Lieutenant-Colonels Mainwaring & Elkington, under arrest as they prepared to surrender to the Germans (both were subsequently cashiered, Mainwaring to disappear from history altogether, Elkington to join the Foreign Legion and eventual reinstatement in the British Army). Bridges’ wound at Hill 60 was, however, the worst he had suffered, and his leg had to be amputated that night. He would recover once again, however, and hold various positions, including Governor of New South Wales, before his retirement in 1927. Brigadier-General Francis Aylmer Maxwell V.C. D.S.O., G.O.C. 27th Brigade, 9th Division, killed by a sniper’s bullet at close range on 21st September while inspecting captured trenches at Zonnebeke; never one to hold personal safety in high regard, he was sitting on the front of the parapet watching wiring taking place when he was hit. He was 46, and is buried in Ypres Reservoir Cemetery. Brigadier-General Frederick William Henry Walshe D.S.O., C.R.A. 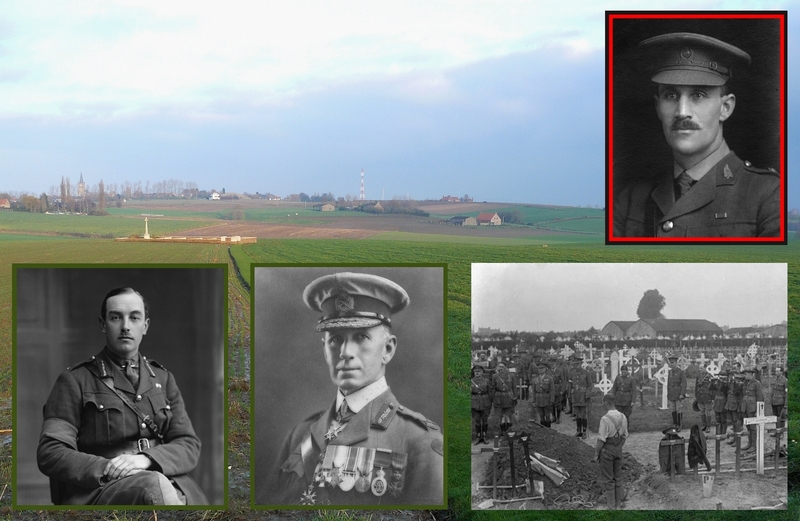 42nd Division (left), severely wounded on the Frezenburg Ridge on 26th September, and Brigadier-General Stephen Lushington, C.R.A. 41st Division, wounded near his headquarters at Berthen on 27th September. Both men returned to command, as did Brigadier-General Henry Clifford Rodes Green, G.O.C. 20th Brigade, 7th Division, slightly wounded during Third Ypres on 5th October, of whom I have no photo. Brigadier-General Edwin Tivey D.S.O., G.O.C. 8th Australian Brigade, 5th Australian Division, wounded in the right arm on the morning of 22nd October on the Westhoek Ridge, although he was able to walk to the nearest first aid post. On 28th October Brigadier-General Cecil Godfrey Rawling, G.O.C. 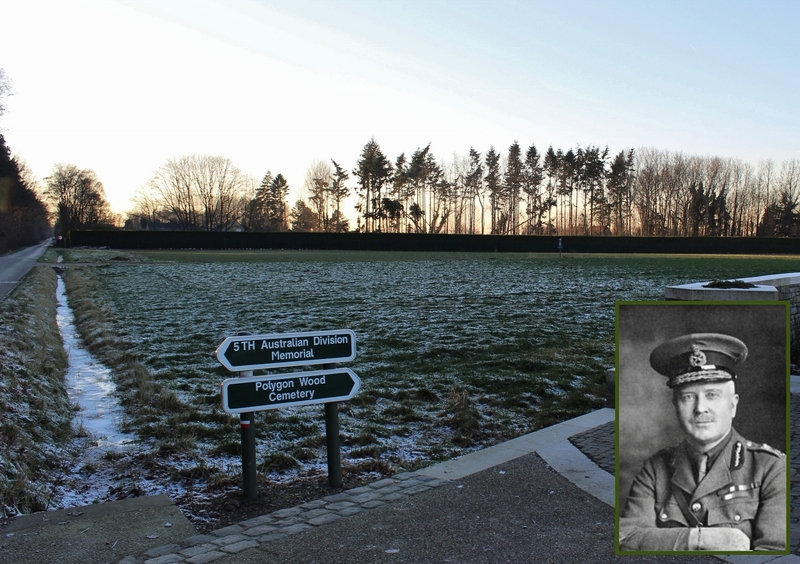 62nd Brigade, 21st Division (left), was killed by a shell in Hooge Crater (main picture) while talking to staff outside his brigade headquarters. Aged 47, he is buried in Huts Cemetery, Dikkebus. In Mesopotamia, Brigadier-General Charles Frederic Watson, G.O.C. 180th Brigade, 60th Division (no image), was slightly wounded near Beersheba in Palestine by ‘hostile bombs’ on 5th November, but more importantly, Lieutenant-General Sir Frederick Stanley Maude D.S.O., C. in C. Mesopotamian Expeditionary Force (centre left) died of cholera in Baghdad on 18th November aged 53, and is buried in Baghdad (North Gate) War Cemetery, Iraq. On 24th November Brigadier-General Arthur Cecil Lowe D.S.O., C.R.A. 66th Division (centre right), was killed in action at Ypres and buried in Ypres Reservoir Cemetery aged 49, and on 28th November Brigadier-General John Tyson Wigan D.S.O., G.O.C. 7th Mounted Brigade, Desert Mounted Corps (far right), severely wounded in the South African War, wounded at Suvla Bay on Gallipoli in 1916, wounded again at Gaza in April 1917, was wounded once more in the Sinai Desert. You will have spotted that Lieutenant-General Maude died of cholera, and I did promise you at the start that all the generals who died that are featured in this series died of enemy action, and not sickness or disease. Maude gets a mention here because on 12th April 1915 near St. Eloi, as G.O.C. 14th Brigade, 5th Division, he had been hit by a stray bullet which went through his right arm and penetrated his side, lodging close to his spine. He nonetheless walked (!) to the nearest dressing station, and would be back in England before the bullet could be removed. And he gets a mention because he was a larger than life character who epitomizes the look of the mythical ‘Chateau General’ but who quite categorically wasn’t! 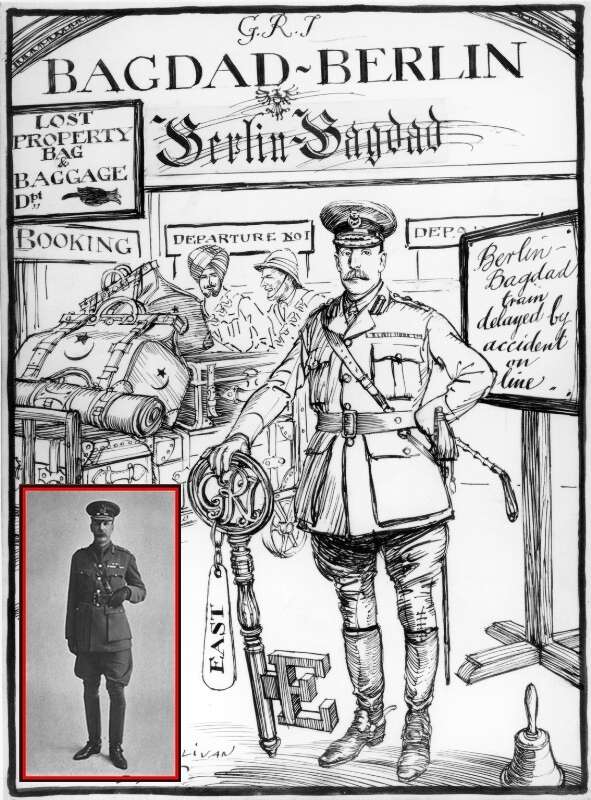 On 30th November 1917, Brigadier-General Edward Hall Stevenson, C.R.A. 29th Division (no image), was wounded in the knee by shell fire at Cambrai. The same day the youngest British General Officer to die in the war, Brigadier-General Roland Boys Bradford V.C. M.C., G.O.C. 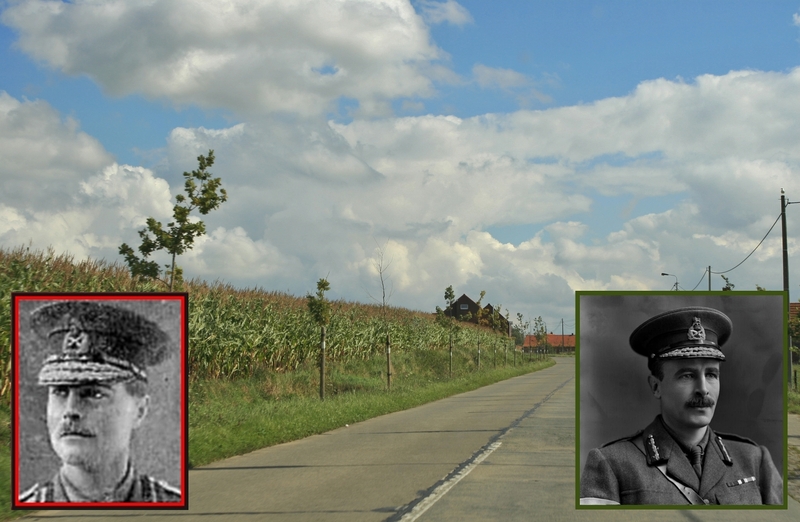 186th Brigade, 62nd Division (left), was killed by a shell near Graincourt. Bradford had been awarded a Victoria Cross for his heroism on the Somme on 1st October 1916, and had already been wounded twice, the second time only weeks before his death. He was only 25 when he died, and is buried in Hermies British Cemetery. Two of his brothers, one also a holder of the V.C., also died in the war. Brigadier-General Frederick Gustav Lewis, G.O.C. 166th Brigade, 55th Division (no image), was wounded by shell fire on 1st December near Epehy, and on 20th December Brigadier-General Arthur Melland Asquith D.S.O. & 2 Bars, G.O.C. 189th Brigade, 63rd (R.N.) Division (right), already wounded three times, was wounded one last time, on this occasion resulting in the loss of a leg. A little under ten and a half months of war left. And two major offensives. How would our generals hold up through another year? And as the end of the war appeared on the horizon, would they retreat to their châteaux to see out the final months? I remarked that most generals you mention in your posts are Brigadier-Generals, most in charge of a brigade. Until a long, long time ago, Belgian brigades were also led by Brigadier-Generals, but then that changed and Brigade commanders were full-colonels. In fact, the rank of Brigadier-General in the Belgian Armed Forces is rarely “bestowed” on someone. Only when a certain posting requires a general (like in NATO), full-colonels get the (temporary) rank of Brigadier-General, but when they finish that posting, they go back to their previous rank of colonel (except those very few that get promoted to Major-General). I wonder if that was the case in WWI, or did they keep the rank until they retired or got promoted? It is a very interesting and good point, Chris. Not having a military background I get very confused with ‘acting’, ‘temporary’ ‘substantive’ and so on. As far as I can see, in the British Army “the rank of brigadier was long considered a temporary rank and while its holder was addressed as “brigadier,” he would retain the substantive rank of colonel or lieutenant-colonel if not selected for promotion to general officer rank.” And yes, I copied that, and still don’t really understand. Also: “The rank title brigadier-general is still used notwithstanding that brigades in the army are now commanded by colonels.” which I do understand. Your inclusion of photographs and insets in this series puts a fine personal touch to your descriptions. I found particularly poignant your comments on Lieutenant-General Robert George Broadwood and his compassion by not wishing to send his men on hopeless missions, as undoubtedly ordered by High Command who then reproached him. Were they “Chateau Generals”? The nail on the head, Sid. You have hit it. Twice. The background to the series will all be explained in the final post, but the difference beteen this study of the generals KIA and wounded and others is, I hope, the photos, which are designed to add exactly that – the personal touch. In fact I wrote the finish to the series last night and I reckon you must have been lookng over my shoulder! And were High Command the real Chateau Generals? Well hell yes. Not that I am automatically saying that they were wrong in so being – there has to come a point when somebody stays at the rear to direct, surely – but I do believe that it is the generals of High Command that spawned the Chateau Generals myth, which then filtered down through time to encompass generals per se. And how many full generals were there in total? Not very many, as you will see next post. Broadwood deserves a study of his very own, in my opinion. Having said that, I shan’t be doing it. This series was tough to do, once the scope had been ascertained, and I am looking forward to getting back to what we do best here: touring the cemeteries. The new tour will start very soon.